2014 Geneva Motor Show will be remembered for introducing this new supercar in the growing automotive industry. Our model for today is stunning McLaren 650S Spider 2015. The removable hard-top version of 650S coupe carries lot of identical design elements with it. For this we do thank McLaren as what’s good is meant to be carried but we also expect something more innovative in coming time. However for now we have this splendid model with its thunderous power. 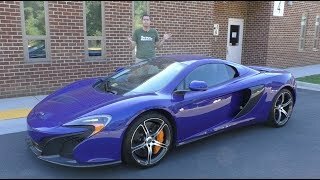 Let us have a look at the review of McLaren 650S Spider 2015 and know this release better. Interior of McLaren 650S Spider 2015 is very much identical to its coupe sibling; however to us two changes came into notice. One is a natural change rising due to removable hard-top replacing the hard-top and thus increasing visibility and space. The second change is with B-pillars blocking the space which once was for the aft side window. 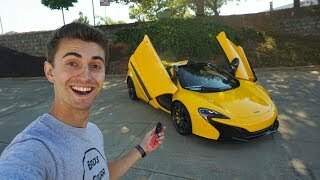 Entire interior of McLaren 650S Spider 2015 has been made using Alcantara and carbon-fiber giving it luxurious touch while simultaneously contributing to the weight also. In the entertainment segment the McLaren 650S Spider comes housed with features like SiriusXM radio, Bluetooth, audio streaming and voice control as standard. Center stack is loaded with same controls while the infotainment screen as well maintains its position as in coupe model. Exterior of McLaren 650S Spider 2015 is mirror image of the coupe model apart from these few changes that we noticed at the rear section of model. Roof Pillars get bit of repositioning with C-Pillars taking a move ahead turning to be the B-pillars. Engine is housed at the rear but the transparent shield now allows lesser visibility of the massive engine. The rooftop of McLaren 650S Spider 2015 with a single push of button can open or close up to the speed of 19 mph, taking 17 seconds in total. 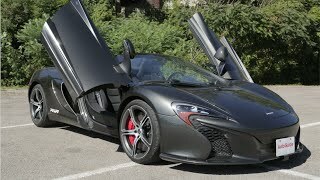 Powered by a 3.8 Liter V8 Twin Turbo engine, McLaren 650S Spider 2015 thunders enormous output of 641 hp and peak torque of 678 nm paired to a seven-speed SSG transmission. 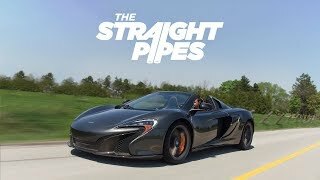 With this power rolling its wheels the McLaren 650S Spider 2015 is capable of reaching a top speed of 204 mph with its standstill to 62 mph sprint being knocked in 3.0 seconds only.